Schematic representation of the eye and principal types of retinal neovascularization and fibrosis/gliosis. (A) The anterior segment of the eye, consisting primarily of the cornea and iris, is separated from the posterior segment by the lens. The posterior segment consists primarily of the vitreous and the retina. 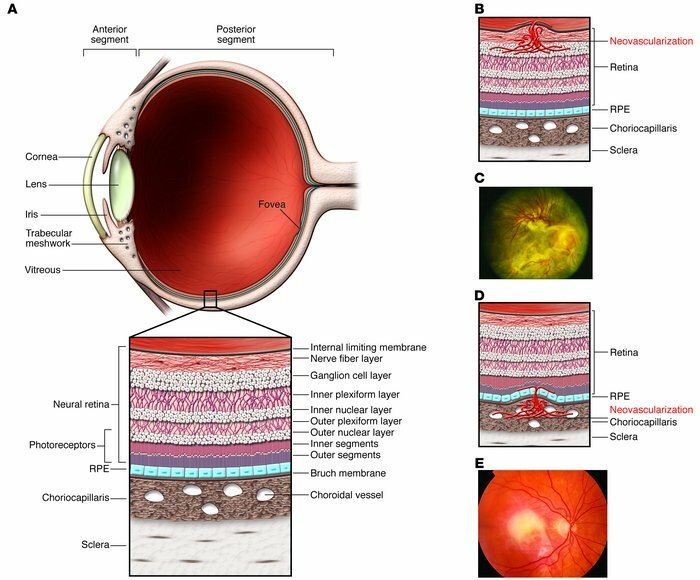 (B) The retina is a highly ordered, multilayered structure that is richly vascularized. Ischemic retinopathies, such as DR, can lead to ischemia and neovascularization on the surface of the retina. (C) In extreme cases, associated gliosis can lead to tractional retinal detachments. Reproduced with permission from the American Academy of Ophthalmology (122). (D) ARMD can be associated with subretinal neovascularization originating from the choriocapillaris, and this can lead to subretinal hemorrhage and fibrosis (E).